Matt Mays with his band inside the World Cafe Performance Studio. 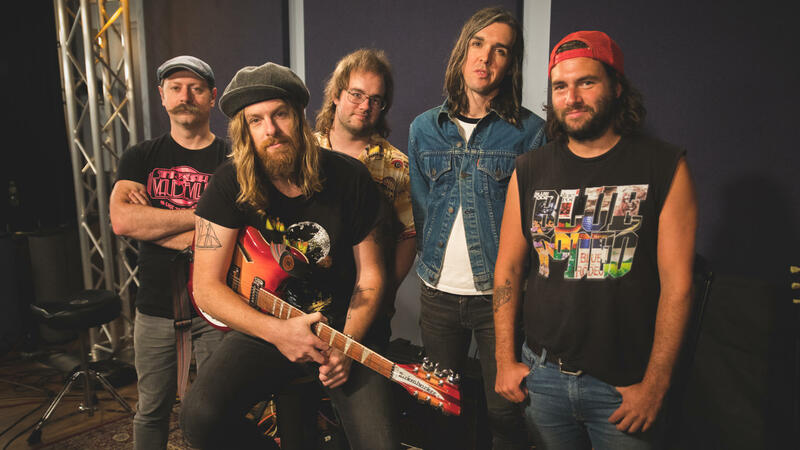 Leave it to Matt Mays to infuse a daytime studio visit with the spirit of a super sweaty, late night at your favorite dive bar. Mays performs big rock songs from his latest album Once Upon a Hell of a Time featuring the sound of three simultaneous guitars and one heck of a growl. Mays credits Melissa Cross' "The Zen of Screaming" with saving his vocal life. Mays also delivers an acoustic performance of his song "Ola Volo," a song named for the inventive and intriguing artist who inspired the tune. It's a preview of what's to come on Mays' upcoming album, Twice Upon a Hell of a Time, which will re-imagine and strip down the songs from Once Upon a Hell of a Time.